Tune in next year for more of the same. Hmmm. The village show (where the standard of vegetable growing was scarily high; clearly I’m going to have to raise my game) was followed by a gala barbecue and ceilidh. The onions for the sausages and burgers were provided by the sacrifice of the first prize winner and half of the runner up in the ‘heaviest onion’ competition which fed pretty much the whole parish (the secret, apparently, is to use American onions). We finished up by eating the losers in the various baking competitions and swapping theories as to exactly what dark secrets were involved in actually winning anything. Then everybody worked off the calories in time-honoured tradition by getting all the steps wrong in the Canadian Barn Dance, Virginia Reel, Gay Gordons, Duke of York and an entertainingly bonkers number called the ‘Flying Scotsman’ which was a new one on me. There were a few people who knew what they were doing but they were fortunately outnumbered by people who didn’t but thought they did, people who didn’t but were willing to have a go, people who didn’t pay attention during the instructions and made it up as they went along, small children, women dancing as men, men dancing as women, and us. We finished with an Orcadian Strip the Willow – dance re-imagined as contact sport – and an enthusiastic don’t-know-the-words-but-kind-of-remember-the-tune rendition of Auld Lang Syne and then the band left in search of a stiff drink and the rest of us drove (sorry) home very carefully so we didn’t hit any of the teenage population of the village who were undoubtedly lurking in the dark somewhere snogging and drinking cider. All of which may go some way to explain why I have woken this morning with what I can only describe as a bad case of ‘ceilidh shoulder’. Next year, clearly, I’m going to have to get into training. And get me some of that onion hormone growth factor to boot. It’s the village show this afternoon at Nearest Village, and as we were drinking our morning coffee, I was telling the other half about some gossip about it I’d picked up from somewhere. A nice man came and took my old bike away today. It feels like the end of an era. In fact, damn it, it is the end of an era. My father bought it in the late 80s as a reconditioned second-hand bike to get him to and from the tube station after he’d torn the calf muscle in his leg (he had another bike at the other end and special permission to roam on it down the corridors of power. Now there’s a piece of separated bike infrastructure for you…). When I went up to university I ‘borrowed’ it for my final year and it then went on to my sister for a while before I claimed it back. I took it to Bristol for a year and learned of the adrenaline rush that comes from racing down hills in the bus lane, a bus in front of me, a bus behind me, no more than a foot of clearance between us, just praying that nobody braked suddenly. That was also the year I learned why you don’t run orange lights on a bike, or not on the Marylebone road, anyway. When we were living in Maidenhead without a car our bikes were a godsend, allowing us to get out into the country which we simply couldn’t do any other way. I’ve fond memories of pootling along tiny open country roads on it, or plugging up – and then plunging down – Winter Hill, and less fond memories of long walks home with a variety of punctured tyres. It got me to and from work in Slough when there were train strikes, and it was there – on Dorney Common – that I was pelted with brussels sprouts (uncooked) by four lads in a Ford Fiesta. I accelerated after them, naturally. I don’t know what I would have done had I caught them. Fortunately my legs were not up to the task. I first tried commuting regularly on it from Ealing Broadway station to Kew, eliminating the dreaded 65 bus from my life. I thought I’d do it two or three times a week, weather permitting, in fact I rode that bike every single working day I could. Hail, sleet, snow, torrential rain, or a mix of all four are as nothing compared to the misery of waiting for the 65. Since then it’s been a fixture of my last blog and it’s survived being locked up all over London, with nothing but its lighting brackets getting pinched. Twenty years on, and it’s time to return the bike to its original owner after what may have been the longest loan in history. I’ll miss it, sort of. 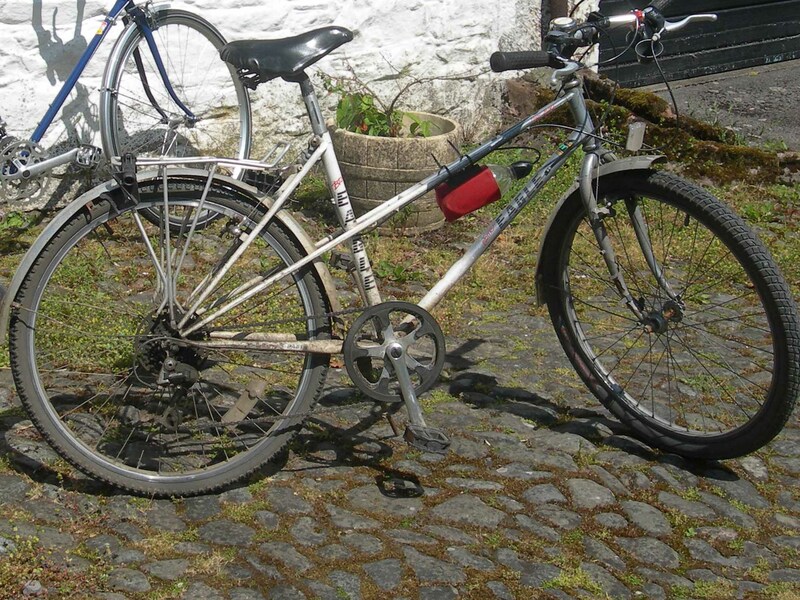 It was never a pretty bike (and its brand name – British Eagle – has since fallen on hard times) but it was a sturdy one, reasonably reliable despite more or less zero maintenance from me, and easy to ride. It’s done me proud. In an attempt to enhance my – sorry, actually have a – social life locally, I have joined the choir in Nearest Village. (No I can’t sing, why do you ask? The poster said they were looking for good, bad and mediocre voices, and I took them at their word). Now as Nearest Village is a mile and a half away, there’s no way I’m going to drive there, and it’s too far to practically walk, which means I’m going to have to start cycling in the dark again, for the first time since I stopped commuting. Going out wasn’t too bad, at 7pm, what with the long summer evenings here, but by the time we finished it was 8:30 and dusk. I have lights but they’re the sort of lights I had in London – ones to make you visible to the drivers, not ones that actually light up the road. Out here it gets dark. Very dark. Very very dark. If tonight, in the dusk, under the trees, was anything to go by, I’m going to have to get new lights. Until then, it’s probably fortunate that I know the road well enough that I could ride it blindfold, because that is basically what I will be doing. Any rural cyclists out there? What illumination do you use? It was harvest time again up at the veg plot today – digging up pretty much all of the potatoes while there was still some sunshine in which to leave them. It was a pretty impressive haul, even if I do say so myself, including some ludicrously large ones, and one simply ludicrous one – if the village show included a category for ‘grow your own Mr. Blobby lookalike, complete with head and arms’ I tell you, I’d be waltzing off with the prizes this year. Ooh I had a busy day today – a dentist’s appointment in Notso Bigtown, work to do in the morning, plus I wanted to plant out the next lot of lettuces and … er, well that’s it really. Make lunch. Do a little laundry. Get out on the bike. Catch up on some paperwork. Get to the post office. Um… I don’t know, it seemed frantic at the time. There was a time, not so very long ago, that I was managing to hold down a full time, fairly responsible, job, commute two plus hours a day and then blog about it, AND write a novel. I’m not entirely sure whether if I met that person again, I would even recognise her. I certainly wouldn’t be able to keep up. Where did I ever find the time? You are currently browsing the Town Mouse blog archives for August, 2009.